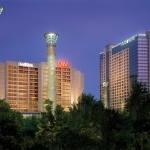 Organizers of the sixth Panel & Engineered Lumber International Conference & Expo (PELICE) have added two keynote speakers for the event to be held April 13-14 at the Omni Hotel at CNN Center in Atlanta, Georgia, USA. Attendee registration opens January 1 for the sixth Panel & Engineered Lumber International Conference & Expo (PELICE) scheduled April 13-14 at the Omni Hotel at CNN Center in Atlanta. The sixth Panel & Engineered Lumber International Conference & Expo (PELICE) will celebrate its 10-year history as part of the event to be held April 13-14, 2018 in the Grand Ballroom North of the Omni Hotel at CNN Center in downtown Atlanta, Georgia, USA. Held every other year, and hosted by Panel World magazine, the first PELICE took place in 2008. All of them have been held at the Omni Hotel, though participants will remember the first one in 2008 occurring on three levels of the hotel, before the event settled into the Grand Ballroom North in ensuing years.